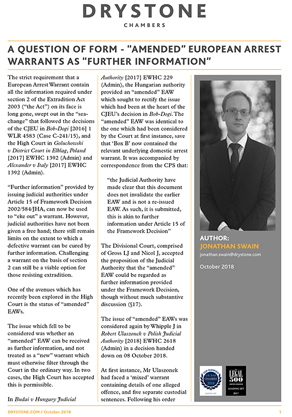 In the following article, Jonathan Swain discusses a change in approach to European Arrest Warrants further to the myriad of changes introduced by three recent decisions: Bob-Dogi  1 WLR 4583 (Case C-241/15), Goluchowski v District Court in Elblag, Poland  EWHC 1392 (Admin) and Alexander v Italy  EWHC 1392 (Admin). The headline change is with regards the previously strict requirement that a European Arrest Warrant contain all the information required under section 2 of the Extradition Act 2003; in this article Jonathan discusses how this requirement has changed and outlines issues and strategy in dealing with these warrants. Jonathan is a specialist extradition law practitioner and has developed a busy practice in this complex area. He regularly appears at Westminster Magistrates’ Court and on appeal at the High Court, representing both Requested Persons and Judicial Authorities. Prior to joining Drystone, Jonathan spent 18 months in the Extradition Unit at the CPS.